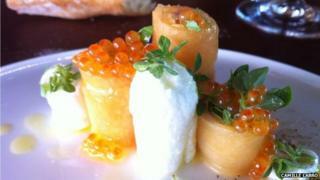 Two Michelin-starred French chefs are cracking down on customers who take photographs of their food, it's been reported. Gilles Goujon, who runs the three-starred L'Auberge du vieux puits restaurant in Fontjoncouse in southern France, says it is poor etiquette to take photos of food, and more importantly, every time his creations appear on social networks it "takes away the surprise, and a little bit of my intellectual property", news website France TV Info reports. Another chef, Alexandre Gauthier of the Grenouillere restaurant in the northern French town of La Madelaine-sous-Montreuil, has gone as far as to add a "no cameras" logo to his menu - although photography isn't strictly banned there. Gauthier lamented the fact that customers now take pictures of the food rather than the people they are dining with. "Before, they were pictures of family, grandmother, and now we take pictures of food… We tweet, we like, we respond to comments, and the dish is cold." But not all fine dining establishments take the same view - some have even been known to offer food photography courses.